When fishing rivers and streams, the strikes are more emphatic, otherwise the presumed meal is swept away by the current. When we fish a river then we need to realize that the fish hold in certain places and they only move for a reason. They need oxygen, food and security. The fish will not be holding in fast moving water because it wastes a lot of energy on their part. They pick spots where there are back currents and eddies with zero flow of water. These places are to be found behind rocks in seems, etc. The fish will hold in a place where the energy expenditure is advantageous. We keep this in mind when we walk the river bank searching for promising holding spots. We are not trying to locate the fish themselves rather the places where we can infer they will be holding. This is called reading the water. These holding places are obviously going to be similar from river to river. Some anglers are more “literate” than others but the ability to read the water is rather quickly picked up by anglers as they gain experience. Classical river fishing is so-called “quartering downstream” technique. We cast our fly across the river to the opposite bank 45 degrees to the current, let it sink and the current swings our fly over to our bank. When the fly is on the dangle (directly down-stream of us) we make 2 strips of the line (sometimes you can let the current take that slack and get a strike), take one or two steps down river and repeat. In this fashion, we can cover the pool well. Most often the fish will take the fly at the end of the swing. This method is also called down and across. Another method is to cast a weighted fly or flies upstream of us and let them sink then let the current move the fly downstream of us. This method is called nymphing or high sticking as we hold the rod higher and follow the fly line as is progresses downstream. 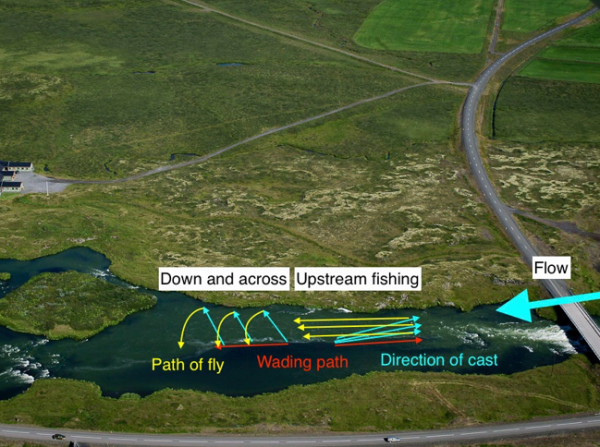 This way, when we present the fly, we can let it trace out a section of the river we are fishing. For this method, you will want a leader that sinks well, and you do want a slack in the leader, so the fly or flies have time to sink before the current starts tugging the fly line. With this method, you move upstream. After the fly or flies have sunk you do not want any slack then you will not notice the strikes. A strike indicator (bobber) is a great way to go, watch it and when it bobs you strike. A note on etiquette – the angler moving downstream yields to the angler coming upstream. 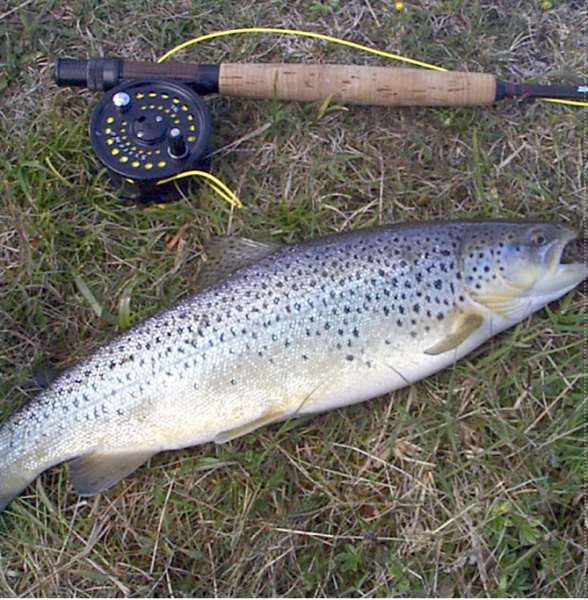 A dry fly that is cast onto a moving water must float naturally without any drag (unnatural movement of the fly when the line tugs it because of current). We cast a dry mostly upstream of us and we like to have a slack in leader or fly line to secure a drag free drift. Too much slack is not good because now you have a problem striking the fish. So just enough slack for a drag free drift, with a possibility of hooking the fish. It is tremendously rewarding to see fish eat the fly on the surface. The riffling hitch is a method from the salmon fishing school. We make the fly ride in the surface with a taut line and it will form a “Vin” in the surface. We cast 45 degrees cross current and now we allow no slack and the fly will rise to the surface by the pull of the fly line. There it forms a big or small “V” depending on its size as it skates across the river to our bank. Originally, after the fly was tied on in the usual way, an extra hitch was placed around the shank just behind the head of the fly and tied there (Portland Hitch). This makes the fly swim sideways in the surface and form the “V” we are seeking. Today we have another simpler way to get the desired outcome. Now we use a plastic tube fly, and we make a hole in the side in front of middle of the tube. The leader goes in there and out through the end where we tie the hook. The hitching tubes are wonderful fun. When salmon takes these tubes it a spectacle, never to be forgotten. Big trout will also attack hitching tubes.